The chances of the Syrian peace conference going ahead as scheduled on January 22 do not look too good. 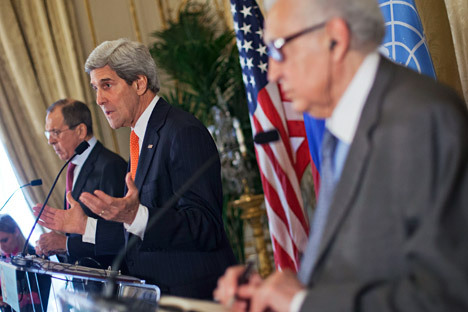 The idea of holding the Syrian peace conference came during a visit to Moscow by U.S. Secretary of State John Kerry in May 2013. The purpose of the event is to implement the international agreements reached in Geneva in July 2012, and kick-start a political settlement of the Syrian crisis by dragging representatives of the Bashar Assad government and the opposition to the negotiating table. It is expected that Swiss President Didier Burkhalter will be the first to address the delegates on the first day of the conference. He will be followed by UN Secretary-General Ban Ki-moon, and then by the two co-initiators of the event, Russian Foreign Minister Sergey Lavrov and Kerry. Syrian representatives, both from the government and the opposition, and foreign ministers of other participating states have also prepared their speeches. Invitations to attend the conference have been sent to 30 different capitals, including New Delhi. Once the orations have been delivered, the warring factions are supposed to start negotiating. Obviously, everyone understands very well what a challenge this is going to be. In essence, Kerry was using the media, rather than direct channels of communication, to urge the Syrian opposition to attend the Geneva 2 conference. The opposition was expected to confirm its attendance on January 17 – but the confirmation has yet to arrive. This inevitably raises questions about the political relevance of the part of the Syrian opposition that is usually described as external, i.e. led by émigrés, and that is represented by the National Coalition of Syrian Revolution and Opposition Forces. The radical groups Jabhat an-Nusra and the Islamic State of Iraq and the Levant, which want to create an Islamic Caliphate and impose Sharia law in Syria, are even less inclined to negotiate. They are not interested in the entire peace process. Obviously, such a situation devalues any possible result that may be reached at Geneva 2. Moscow proposes redressing the balance by also inviting the internal Syrian opposition that continues to work within the country’s political system. “From the very beginning of preparations for Geneva 2 we have been speaking in favour of having the internal opposition, the patriotic opposition also represented at the Syrian settlement conference,” Lavrov said. He added that it would be especially useful to secure the participation of the National Coordinating Committee and the bodies representing the Syrian Kurds. So far, however, none of these outfits has received an invitation from the UN Secretary-General to attend the conference.